It has been a challenging term for M2 but the whole crew has really risen to the occasion to get some good training in despite the challenges of needing frequent subs and the two boat rule coming into effect in the second half of term. For the race itself we needed two subs so special thanks must go those who agreed to give up their friday morning on such short notice. The race began with a power ten pas our own boathouse with supporters cheering from the hard. We were pushing rate 30 past the combined boathouse and really opened up down the reach with another power ten. Unfortunately the luck of the draw had place us in front of an M1 crew who failed to communicate well as they came by at ditton corner, forcing us to hold it up to avoid and accident. The crew rallied magnificently however and quickly wound it back up to race pace for the rest of the course, setting a good time for us to build on as we start looking towards the lents! Having built some momentum at Henley the previous weekend, M1 were keen to be let loose on the Fairbairns course. 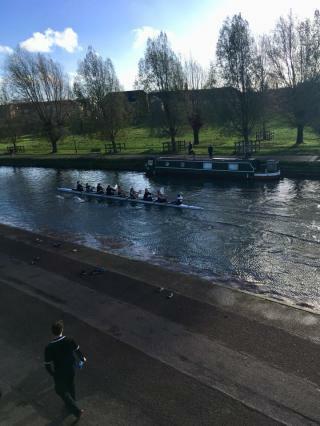 A last minute reshuffle in the start order meant that we were set off behind Queens’ M1, the crew we will be chasing on Day 1 of the 2019 Lents. We went past the THBC boathouse at 36, and completed a stressful stride to 32 around the combined boathouses. This steady race rhythm allowed us to chase down the gap to Queens by the reach. The rowing became tough as we got into their wash, but a refocus call from cox Ed Bryan made sure the rhythm was never lost. As we rounded first post corner and raced towards the finish, Queens conceded the racing line and allowed us to finish alongside them, at a relatively steady rate of 34. Being the 6th fastest college 8+ gives us a solid baseline for the Lent Bumps, and as captain I look forward to seeing what this crew can achieve. Trinity Hall women exceeded everyone's expectations by coming as the 3rd fastest women's boat on the river, just after Jesus and Caius with a close-to-record-breaking result of 16:59 minutes for the whole course. W2 did a tremendous job of coming in 4th amongst all W2s with a great time of 19:05 minutes for the whole bumps course.